Knowing your long and short-term objectives, having a solid focus on where you’re going along with the flight plan to get there is a fundamental to success in any venture. But what about others’ vision of you? As a leader, how do your co-workers employees and customers see you? Will they follow you when times are tough? George Patton once said, “You’re always on parade.” What you say, how you say it, and how others view you really counts when it comes to enrolling people to support your vision. Without a team of supporting wingmen who trust you and your vision, achieving your vision will be next to impossible. A key component when enrolling others in your vision is your personal presence. Personal presence may be difficult to define, but you know it when you see it. People with presence look confident and comfortable, speak clearly and persuasively, think clearly—even under pressure. They act with intention and integrity. What they say and do matches who they are. Wherever you are and whatever target you want to reach, presence can help you get there. 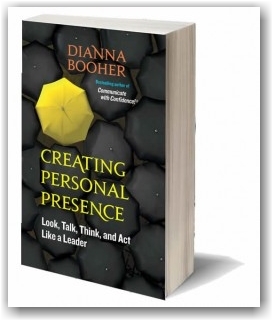 That’s why I would like to recommend a book from my colleague, business communication expert Dianna Booher, Creating Personal Presence: Look, Talk, Think, and Act Like a Leader (Berrett-Koehler). In it, you’ll learn 20 principles and hundreds of practical tips to improve your communication, increase your credibility, and expand your influence. As a bonus for ordering on Amazon TODAY, Tuesday, OCTOBER 4, you’ll receive bonuses worth more than $2,100 from 15 celebrity authors and experts—including my own bonus. I’m confident you’ll get a ton of value out of it. Let me know what you think.